So it turns out I’m not that great at keeping my camera in a safe place where it doesn’t go walk about, hence why, although I have been crocheting my squares, you haven’t seen them yet. 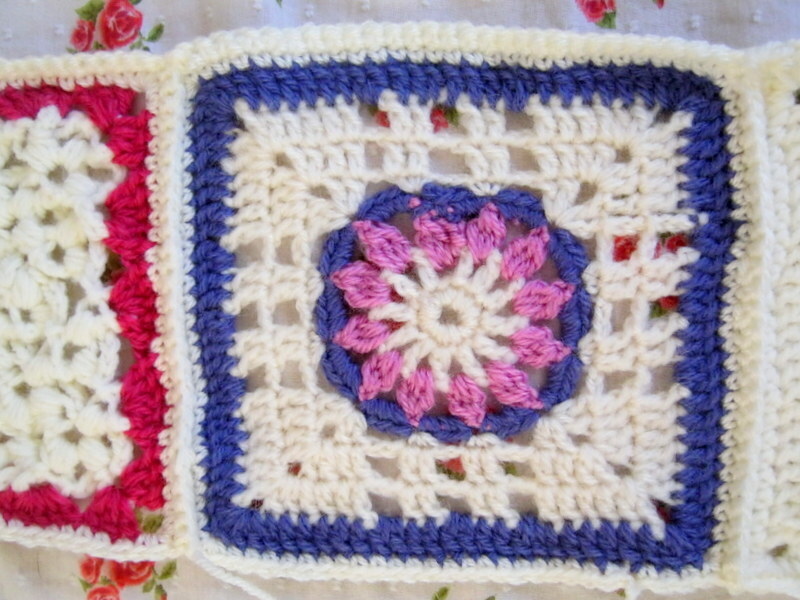 However, the lovely house fairies (who I swear ‘borrow’ my camera; odd socks; teaspoons and pretty much everything else I manage to misplace) did very kindly bring it back at the weekend, so here are the squares from the last few weeks (I’ve already joined them into the blanket). This one is from 75 floral crochet blocks. In the book it’s inspired by spring blossom but I thought it looked a lot like the frost that delicately makes everything gently sparkle first thing in the morning at the moment. It’s made up of lots of puff stitches and chains and is easier to work than it looks. Although, I’ll be honest I did try to follow the written pattern and had to frog a few times before I decided to follow the diagram instead but once I’d switched, it was no problem and if I wasn’t quite so inept at reading patterns, I probably would have got the hang of it a lot sooner. I enjoyed trying a new stitch and getting a different effect. Now you would think that this was week three’s square as the last one was week two’s however it is in fact another square for week two. There are a couple of reasons for this. 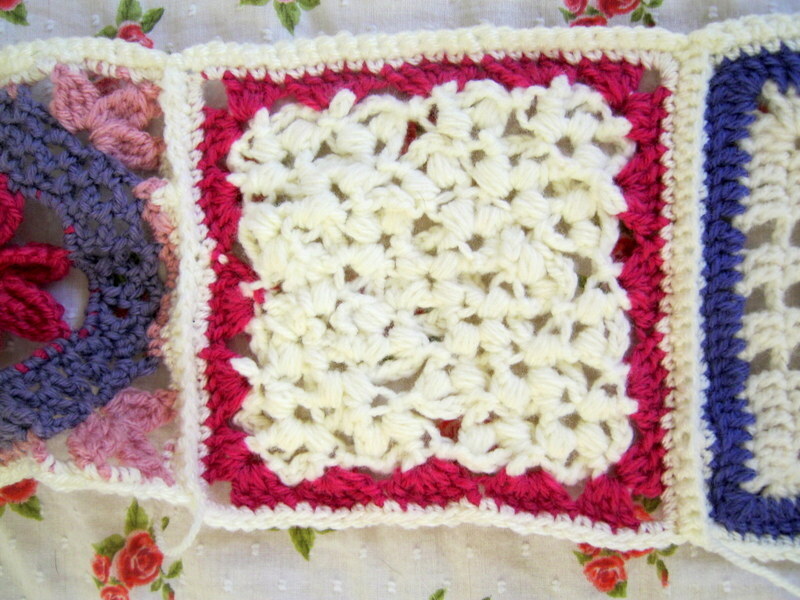 Firstly, I decided to make a blanket that is 7 by 8 squares so I need 56 squares in total. 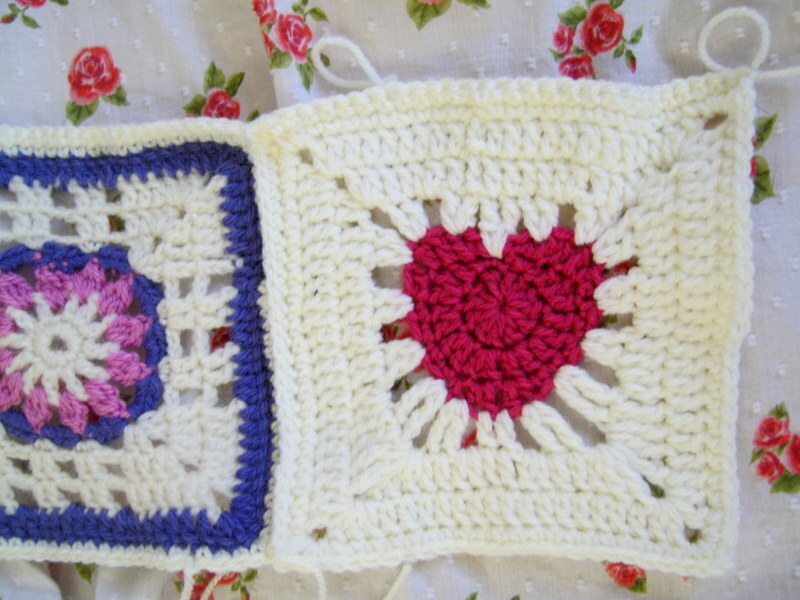 This means that I need to make 4 extra squares at some point and this is one of them. Now I said that there were a couple of reasons. I have been knitting Little Miss a cardie but have had to stop as my hand is hurting again. I can sew and crochet but knitting makes it hurt so I’m resting it. If you know me, I am completely unable to go a few days without doing something crafty and so I decided to make another square because I wasn’t brave enough to start sewing my embroidered quilt (which I mentioned a few posts ago). I have since plucked up the courage and taken the plunge. When I can get some nice pictures, I’ll show you have I’m getting on! Anyway, back to this square……I really did it because I liked the pattern. It came from 200 Crochet Blocks.